Visit bit.ly/WAWild and click on the various ‘Favorite Things Baskets’ for more information and bidding instructions. 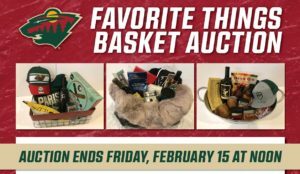 14 Minnesota Wild players and their wives/girlfriends put together baskets of their favorite things. Proceeds from the auction of these baskets are to benefit Women’s Advocates, the first domestic violence shelter in the nation. **Due to the size and nature of the baskets, they are pick up only items. MN Wild will not ship them.